Samsung officially announced its much-anticipated Galaxy S8 and S8+ smartphones today at simultaneous launch events held in New York's Lincoln Center and London's Olympic Park. The company's post-Note7 comeback device and de facto "iPhone 8" rival has already been the subject of several leaks in recent weeks, but today we finally got the full picture of what Samsung's new flagship models are offering consumers who are in the market for a new smartphone this year. 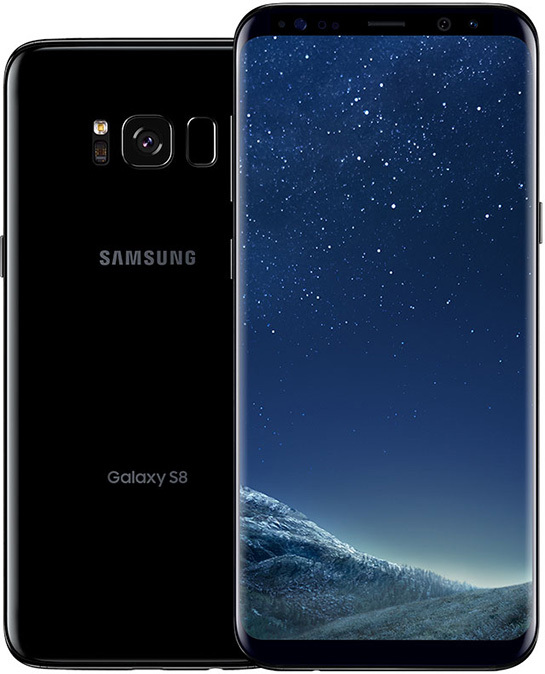 As expected, the S8 comes in two sizes with a curved edge-to-edge 5.8-inch or 6.2-inch QHD AMOLED display. The always-on 18.5:9 ratio screen has a HDR-enabled 2960x1440 resolution within a minimal bezel design that replaces the physical home button with a virtual force touch button embedded in the screen, and moves the fingerprint sensor to the rear of the device, alongside the camera. The rear camera features a 12 megapixel f/1.7 lens, while an 8 megapixel f/1.7 camera with autofocus sits above the screen on the front. Samsung has also integrated iris scanning and facial recognition into the front camera to make unlocking the phone and signing into websites easier. On the right side of the handset is the power button, while the left side houses volume controls and a separate button to activate Bixby, Samsung's new context-aware virtual assistant, developed by the original creators of Siri. Harman Kardon stereo speakers are visible on the bottom of the device, along with a USB-C port and a headphone jack. Inside, the S8 features a Snapdragon 835 processor, a 10 nanometer chip made in partnership by Qualcomm and Samsung. Paired with the chip is 4GB of RAM and 64GB or 128GB of storage with microSD support for up to 256GB. The standard model has a 3,000mAh battery, while the Plus device gets 3,500mAh. Both models support fast wireless charging. On the software side, the S8 runs Android 7.0 and has a Bluetooth dual audio feature that lets users stream audio to two separate headsets or speakers at the same time. There's also a multi-window feature that enables two apps to run on the screen simultaneously. Another feature Samsung is debuting with the S8 is Samsung DeX, which allows users to connect the phone to an external display, keyboard, and mouse, to use the operating system like a computer. The 5.8-inch Galaxy S8 price starts at $750, while the 6.2-inch 8+ device starts at $850. Prices may vary. Both handsets are waterproof to IP68 standard and come in Midnight Black, Orchid Gray, and Arctic Silver colorways. Pre-orders begin on March 30 and include a Gear VR headset with touch controller. Both handsets will go on sale online and in stores in the U.S., Canada, and across Europe on April 21. The pieces are finally starting to come together for what should be a remarkable battle of the smartphones this year. Apple's widely rumored high-end redesigned iPhone with a 5.8-inch edge-to-edge OLED display will likely launch in September, although the majority of stock may not be available until later in the fourth quarter, according to recent rumors. Apple is widely expected to use Samsung-made AMOLED display technology in at least one of three possible iPhones to be released this year, so the S8 arguably offers the best preview yet of the screen quality of possible future Apple devices. Rumors suggest Touch ID could be embedded in the equivalent Apple display, while iris scanning, facial recognition, and some form of wireless charging have also been floated as possible features of a "10th anniversary" edition iPhone. Apple better have a good answer to this. Looks fantastic. Thank you Samsung for NOT removing the headphone jack. Beautiful phone! The issue with Samsung phones is that they reduplicate all of Google's efforts. Now you will have two "assistants" on the phone to go with your two email clients, your two web browsers, your two calendars, etc. Apple got lucky with the exploding S7, I don't think Apple will be as lucky this time. iPhone 8 will top it, I know it. Whist Apple will release three phones this year—two with the same design as the 2014 model and the redesigned one will be super expensive smh. The presentation was so lame that I am even more discouraged to buy this phone than before I watched it. It was very artifical, boring and scripted from the beginning to the end. I know what you mean, I rather watch Tim jump around with that smile on his face showing emojis for 1hour.